Blurb Description: Katora Kase is next in line to take over as guardian to a secret and powerful healing Elixir. Now she must journey into the wilds of Faway Forest to find the ingredient that gives the Elixir its potency. Even though she has her sister and brother, an old family friend, and the handsome son of a mapmaker as companions, she feels alone. --I can kiss my own elbow, which I’ve heard makes me a princess. --For the past year I’ve been doing this thing called grounding where I go outside and put my bare feet on the earth. I try to do it every day, even when we had feet of snow and sub-freezing temperatures this past winter. --As a kid, I used to refuse to eat mac ‘n’ cheese with that fake orange cheese. --When I was three, I insisted that I was a boy because I wanted to play baseball for the New York Yankees. --I asked my husband to give me one more weird thing, and he say I eat peanut cups weird because I like to eat the chocolate around the edge first and save the middle for last. 2. If you were to be Guardian of something (say an Elixir), would you accept? How would you feel? I’d like to think that I would accept for the good of the world or some other noble reason. But I definitely wouldn’t want it sprung upon me like happens to Katora in ELIXIR BOUND. I like to have all the information at hand and have time to think things over before making really big decisions like that. And if it would put my family at risk (especially now that I’m a mom), I might say no. Family always comes first for me. Oh, there are so many. I’ll try to stay away from the super obvious (Harry Potter!). I’d have to go with GRACELING by Kristin Cashore (one of my favorite YA fantasies), THE SKY IS EVERYWHERE by Jandy Nelson (a fabulous contemporary YA), and pretty much anything Maggie Stiefvater has written. Katora, the main character, is stubborn, independent, and introspective. Kylene, the younger sister, is sensitive, giving, and not afraid to show her emotions. Bhar, the younger brother, provides some much needed comic relief but is also immature. Hirsten, the love interest, is meticulous, insightful, and supportive (oh, and has really soft lips). Palafair is of the miniature demick species and is the father figure of the group. Zelenka, also of the demick species, is fierce, brave, and not afraid to speak her mind. It’s so hard to pick a favorite, but I have to go with Kylene because she is based on my little sister who passed away at the age of 16 and was the inspiration behind me not only writing ELIXIR BOUND but becoming a writer at all. I love the scene in chapter five where Katora, her siblings, Hirsten, and Palafair are sitting around the fire telling stories. It’s early in the journey and the night before Katora’s two older sisters are to return home. The mood goes from silly, where the siblings reminisce about their crazy childhood teasing each other, to more serious as they look forward to the dangers of the journey and being in Faway Forest (with a nice kissing scene right in the middle). So much of that scene was inspired by my own childhood growing up in a large family. It was fun to be able to incorporate that stuff into the story. 6. What's after Elixir Bound for you? Stunning and brilliantly conceptualised, Elixir Bound is The Lord of The Rings with a YA fiction twist. Reading the synopsis, I didn't expect much- for the book to be lacking in some way- and I received a very pleasant, unexpected surprise. Elixir Bound can be described in one word- Amazing! In loads of adventure/ quest-y books, you find descriptions to be lacking, leaving too much to the imagination- that lots of people hate doing. Well, I can say with absolute certainty that Elixir Bound is not one of those books. 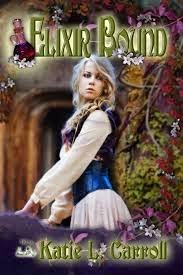 I quite literally felt like I was in the book- especially in all of the major scenes- the Tilli Demick, Yesalda but the best by far was when Katora reaches the field where the flowers of the Elixir are grown. Carroll's ability to envision scenes in uncanny. Don't get me wrong- there is a guy- but refreshingly, this book was not just about what one guy thought about Katora, or whether or not he liked her. Hirsten is sweet sincere and a bit of an introvert. It was pretty much the cutest story ever, which didn't eat up the spotlight, which I really liked. Undoubtedly a must read- for all lovers of YA Fiction! I love Lord of the Rings, so this just wants to make me read it more. Great post! It totally is! Haha, I thought the same the first time I read it! Thanks, CJ! I'm full of useless talents like that. LOL! Hi, Aditi! Thanks for featuring Elixir Bound. Your review still makes me squee with delight, and those were some of the best interview questions I've ever had to answer. Hi, lekeisha! 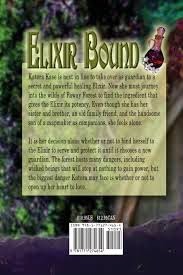 I do hope you get a chance to read Elixir Bound. Good luck with the giveaway. Thank you for sharing your thoughts with us. I enjoyed the review and I am so glad my hopes for this read are on track. I have had Elxir Bound on my wishlist and am looking forward to the read. My Pleasure, Denise:) Good Luck with the Giveaway and I hope you love Elixir Bound as much as I do! Good luck, Victoria! Thanks for stopping by. Not usually a fan of this type of genre, but getting into YA fiction so would definitely love to read it and see. Good luck, Renee! YA is my favorite genre, not only to write but also to read.